Plump up the Skin Instantly with Topical Light Infusion!! 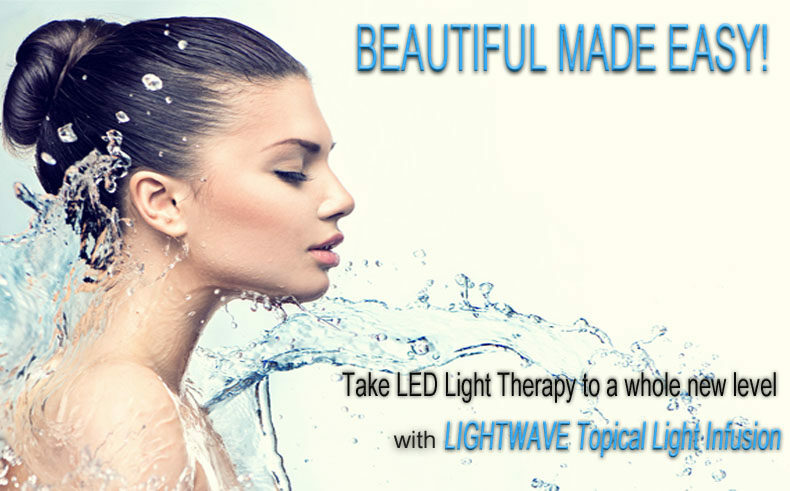 LIGHTWAVE offers the only system that combines our proven cutting edge LED protocols & Topical Light Infusion (TLi) Therapy, making it the obvious choice. Whether you are looking to address facial aging, pigmentation or others areas on the body LIGHTWAVE offers the right technology for you. LIGHTWAVE Topical Light Infusion’s New Plumping Hydration Gel Mask ca potent combination of medical grade Hyaluronic acid and Pentavintin, a skin strengthening and hydrating ingredient. In as little as 15 minutes, these clinical strength ingredients plump up the skin and provide a deep level of hydration that can last up to 72 hours. The skin will appear luminous, hydrated and plumper after just one treatment! *Topical Light Infusion protocols were created specifically to work in conjunction with LIGHTWAVE’s advanced LED light therapy. How does LIGHTWAVE Topical Light Infusion Therapy work? First, the formulated Infusion gel mask is applied to the targeted treatment area. Once the topically infused mask has been applied and initially deposited into the skin, the product is then exposed to specific pulsed wavelengths of LED light for a prescribed amount of time. During the light activation, the topicals continue to be delivered into the layers of the skin so that improved, noticeable results are achieved quickly. The improved delivery of topicals allows the body to use these active ingredients to promote healthier skin tone and texture and overall improved appearance. Register below using LIGHTWAVE’s VIP Code: SP579 for discounted admission!!! We look forward to the opportunity to add substantial value to your skin care practice with our exceptionally innovative LED Light Therapy Systems and Revolutionary Facial and Body Infusion Technology.